Blurb From Goodreads: When dream meets reality. . . Endless fields of flame-like poppies. Vino Nobile di Montepulciano. The sweet, rhythmic chime of church bells. Months upon months of unemployment? Struggling to communicate with locals? Duvets frozen on the clothesline? Jennifer Criswell’s move from New York City to Tuscany was not supposed to go like this. She had envisioned lazy mornings sipping espresso while penning a best-selling novel and jovial group dinners, just like in the movies and books about expatriate life in Italy. Then she met reality: no work, constant struggles with Italian bureaucracy to claim citizenship through her ancestors, and perhaps worst of all, becoming the talk of the town after her torrid affair with a local fruit vendor. 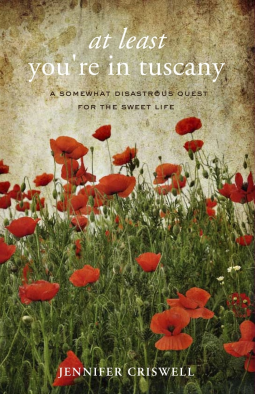 At Least You’re in Tuscany is the intimate, honest, and often hilarious tale of Jennifer’s first year in Montepulciano. During that time, Jennifer’s internal optimist was forced to work overtime, reminding her that if she were going to be homeless, lonely, and broke, at least she would be all those things–in Tuscany. Through all her small-town bumblings, though, Jennifer’s mantra, along with a healthy dose of enthusiasm and willingness to learn about Italian culture, helped her not only build a new, rewarding life in Italy but also find herself along the way.